Disclosure of the continued existence of these two videos is almost certain to intensify the controversy over the tapes that were destroyed -- and accusations that the CIA is engaging in a cover-up of evidence that its operatives employed interrogation tactics outlawed as torture under both U.S. and international law. Rosenberg's five-page letter, addressed to Judge Karen Williams, chief judge of the U.S. Fourth Circuit Court of Appeals in Richmond, Virginia and to Judge Leonie Brinkema of the U.S. District Court in nearby Alexandria, was referring to the trial of Zacarias Moussaoui, the lone suspect convicted in the September 11, 2001 terrorist attacks. Brinkema was the presiding judge in the Moussaoui trial. A copy of the letter, dated October 27, was obtained by The 'Skeeter Bites Report. Rosenberg wrote that his office was informed on September 13 by the CIA that the agency "obtained three recordings -- two videotapes and one short audiotape -- of interrogations" of suspected al-Qaida terrorists. Moussaoui, the so-called "20th hijacker," pleaded guilty in 2006 to charges of conspiring to hijack planes and crash them into the World Trade Center and the Pentagon, admitting that he knew about the attacks and did nothing to stop them. Ironically, Moussaoui was in jail in Minnesota as the September 11 attacks unfolded. He's now serving a life sentence without the possibility of parole at the federal Supermax prison in Florence, Colorado. The U.S. attorney's letter -- which was heavily edited to delete the identities of the suspects -- said that while an accompanying transcript of the interrogation "contains no mention of Moussaoui or any mention of the September 11 plot" and thus has "no bearing" on the Moussaoui prosecution, "The existence of the videotape, however, is at odds with statements in two CIA declarations submitted in this case." Rosenberg wrote that his office was subsequently notified by the CIA in October that the spy agency "had uncovered the existence of a second videotape, as well as a short audiotape," both of which pertained to interrogations of the al-Qaida suspects whose identities were withheld. "On October 18, we viewed the second videotape and listened to the audiotape, while reviewing transcripts" of the interrogations." As was the case in the first video, "the contents of the second videotape and the audiotape have no bearing on the Moussaoui prosecution," Rosenberg wrote. "They neither mention Moussaoui nor discuss the September 11 plot." Are Suspects in Destroyed Videos Also on Moussaoui Tapes? Under sharp questioning from Judge Brinkema, the Justice Department had denied that any videotapes of the interrogations existed. But Rosenberg wrote that the CIA, without the Justice Department's knowledge, "possessed the three recordings" at the time the department made its declaration. The government's declaration, made on November 14, 2005, came amid a dispute between Judge Brinkema and the government over Moussaoui's requests for access to confidential documents and the right to call captive al-Qaida members as witnesses. The government refused, citing national security. Judge Brinkema "ordered the government to disclose various information. . .including whether interrogations were recorded," Rosenberg wrote. The judge later reconsidered most of his order, at the government's request, "but still directed the government to confirm or deny that it has video or audio tapes of these interrorgations." The government responded with a declaration by a CIA executive that "The U.S. Government does not have any video or audio tapes of the interrogations," Rosenberg's letter continued. Because Rosenberg's letter deleted the identities of the suspects interrogated in the tapes cited in the Moussaoui case, it remains unclear whether the suspects on the tapes included Abu Zubaydah and Abd al-Rahim al-Nashiri, who are at the center of the current controversy over the destruction of the other CIA interrogation videos. For his part, Hayden said in a statement on Thursday that the destroyed tape of Zubaydah’s interrogation was "not relevant" to the Moussaoui trial, but he neither confirmed or denied that either Zubaydah or al-Nashiri were among the suspects interrogated in the Moussaoui case tapes. Meanwhile, both the Justice Department and the CIA announced Saturday that they would launch a joint investigation into the tapes' destruction to determine whether it constitutes an obstruction of justice, while congressional Democrats called for the appointment of a special prosecutor to handle the issue. The investigations are almost certain to zero in on Jose Rodriguez Jr., a former chief of the CIA’s clandestine operations. It was Rodriguez who emerged in media reports over the weekend as the official who issued the order in November 2005 to destroy the interrogation tapes -- despite warnings that to carry out the order at a time of intense congressional and judicial scrutiny of the CIA’s interrogation and detention program would raise suspicions of a cover-up of evidence of torture. Some of the destroyed videos may have shown the use of "waterboarding" -- a technique that simulates drowning in a controlled environment. It consists of immobilizing an individual on his or her back, with the head inclined downward, and pouring water over the face to force the inhalation of water into the lungs. For decades before President Bush took office in 2001, waterboarding was considered a war crime by the U.S., which had criminally prosecuted individuals for employing the technique. Ironically, Porter Goss, the CIA director at the time the tapes were destroyed, warned the agency two years earlier while serving as chairman of the House Intelligence Committee to keep the tapes intact, according to former intelligence officials who spoke with The New York Times on condition of anonymity. Goss, whose tenure as CIA director ended with his resignation in 2006 amid much controversy over his management style, was not told in advance about Rodriguez’s decision, the former officials said. Indeed, according to the Times, Rodriguez appeared to have acted unilaterally, without notifying anyone -- not even John Rizzo, the CIA's chief counsel. Was Rodriguez Guided By Gonzales' 2002 Torture Memo? 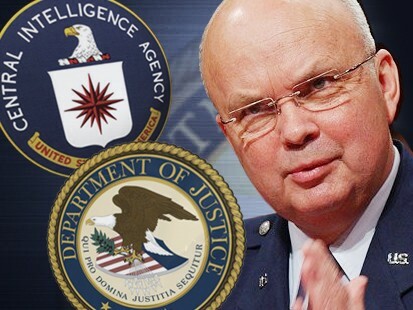 Little is known about Rodriguez, but there is some speculation that his decision to destroy the interrogation memos may have little to do with Hayden's public statement that they were destroyed to protect the identities of the CIA operatives in the tapes. Rather, Rodriguez may have been influenced by former Attorney General Alberto Gonzales' controversial 2002 memorandum to CIA interrogators that critics have branded "The Torture Memo." Gonzales, then the White House counsel, approved -- without consulting military and State Department experts in the laws of torture and war -- the memo that gave the green light for the interrogators to employ "enhanced" techniques, including waterboarding. Working closely with a small group of right-wing lawyers at the White House, the Justice Department and the Pentagon -- and shoving aside dissenting viewpoints in the process -- Gonzales helped chart other controversial legal paths in the handling and imprisonment of suspected terrorists, often in direct conflict with the Geneva Conventions and with America's own Uniform Code of Military Justice. The so-called "torture memo" became a red-hot issue that nearly derailed Gonzales' 2005 nomination by Bush to succeed the retiring John Ashcroft as attorney general. Gonzales himself resigned in disgrace in September amid accusations that he had eight U.S. attorneys fired for partisan political reasons -- which, if true, would be in violation of the Hatch Act. Meanwhile, congressional Democrats called Sunday for the appointment of a special prosecutor to investigate the destruction of the tapes. Appearing on ABC's "This Week," Senator Joe Biden (D-Delaware), chairman of the Senate Foreign Affairs Committee and a candidate for the 2008 Democratic presidential nomination, called on Gonzales' successor, Michael Mukasey, to make such an appointment. For their part, the Justice Department and the CIA's inspector general had announced on Saturday they would conduct a joint inquiry into the matter. That review will determine whether a full investigation is warranted. Biden made it clear, however, that he doesn't trust Mukasey to conduct a thorough inquiry. "He's the same guy who couldn't decide whether or not waterboarding was torture and he's going to be doing this investigation," said Biden, who voted against Mukasey's nomination to become the nation's top law enforcer. "I just think it's clearer and crisper and everyone will know what the truth ... if he appoints a special counsel, [and] steps back from it." But Senator Jay Rockefeller (D-West Virginia), chairman of the Senate Intelligence Committee, said he'd rather see Congress get to the bottom of the matter. "I don't think there's a need for a special counsel, and I don't think there's a need for a special commission," he said on CBS' "Face the Nation." "It is the job of the intelligence committees to do that." Rockefeller continued. Senator Chuck Hagel, (R-Nebraska), the ranking Republican on the intelligence committee agreed with Rockefeller's sentiment. Representative Peter Hoekstra (R-Michigan), also expressed alarm over the destruction of the tapes. Hoekstra, who was chairman of the House Intelligence Committee from 2004 until the Democrats took back control of the House in 2006, said he had never been told that the tapes were destroyed. Already, the Senate and House intelligence committees are both investigating the destruction of the tapes and Hagel said one goal is to know whether justice was obstructed and who in the White House might have known about the fate of the tapes. On the presidential campaign trail, Senator John McCain (R-Arizona) said the destruction of the tapes "harms the credibility and the moral standing of America in the world again. There will be skepticism and cynicism all over the world about how we treat prisoners and whether we practice torture or not." Rival Mike Huckabee, a former Arkansas governor, questioned whether the action was taken for security purposes "or to cover somebody's rear end." "If we're covering somebody's rear end, we need to expose their rear end and kick their rear end for doing something that's against the best interest of the United States," he said. Biden asserted the "easiest, straightest thing to do is to take it out of the political realm, appoint a special prosecutor and let them decide, and call — call it where it is. Is there a criminal violation? If there is, proceed. If not, don't."